Baldwin was raped… it’s in the records… you think he had a motive more compelling than $2000? Indications are Andrew was planted intel agent spurring on the proceedings and making sure Mark got framed. Hoover was their MKULtra Manchurian candidate triggered to perform the murder. LOS ANGELES – October 30, 2018 – Cursorily reviewed was the court case of Mark Richards, et. al. on Appeal, amidst his Superior court case that was in-progress until defense attornies witnessed brakes being slammed down on the courtroom floor. left-open doors – I have delineated within brackets ( below ) as, ” [UPI RESEARCH NOTES]” herein my ‘preliminary report’. Kevin Daniel Moore in partnership with UFO debunker Geoff Reed are pursuit-fixated with a “documentary” ( asserted by Moore ) entitled, ‘Richard Alexander Baldwin’ – threatening to release such in 2019 – surrounding the death of a curiously suspicious fellow named Richard Alexander Baldwin (DOB 09SEP45 / DEATH: 13JUL82 ). While Kevin Daniel Moore remains within the United States where the federal government especially granted a Visa, extending his new American residency, secured by a “sponsor” albeit ‘privately’, having required one quarter ( 1/4 ) of one ( 1 ) million U.S. dollars ( $250,000.00 USD ) within a “Surety Bond” allowing Moore’s ‘residency status’ to have remained for as long as he has already or ‘publicly’ – upon U.S. federal government invitation supporting intelligence interests and in conjunction with a ‘work permit’ through through public-private partnership ( e.g. KROLL ASSOCIATES – as others similarly situated have in the past ) paving a lengthier than typical ‘visit’ to America that might otherwise defy an open and transparent reason for ‘working in the United States’ with or without a permit to do so. Registering requirements, for foreign nationals and agents of governments, is important; especially when ‘American citizens are hired’ ( even to perform services independently as ‘sub-contractors’ ), paid ( in cash or by cheque ), and to be legally conducted in-keeping with ‘proper written notifications’ as-to ‘income tax liabilities’. Visiting America as a ‘tourist’ is one thing, and since Kevin Daniel Moore claims and has been already filmed, witnessed, admitted to disguising himself while ‘filming ( working ) in America’ numerous adventures, interviews and the like comes with either a ‘paper trail’ or ‘no documents’; the ‘latter case instance – illegal in more than a single instance or multiple times should people be unaware of claiming such income from such a foreign national. Fact is, if anyone is being paid any emolument without proper ( legal ) written notifications that could easily entrap an interviewee or other people with unfulfilled liability and or obligation, matters could become very difficult in the future should those same people be subpoenaed at a later date in court or to provide an in-person deposition before attornies later-on so, it might be wise to look before one leaps. In either mysterious events, the ruckus Kevin D. Moore has conducted boils down to his by-far more secretive past involvement with ‘Central Banking’ and ‘Financial Services’ as a corporate secretary and corporate director while simultaneously working as a lowly ‘telemarketer’? In 2003 – 2005, Kevin was company Director & Secretary for E.S.E DISTRIBUTORS LIMITED involved with ‘Central Banking’ and Financial Services’. In 2004, a telemarketer for AGENCY FULFILMENT SOLUTIONS LTD. The Moore Show started as a late-night radio talk show on The University of Glamorgan Atrium Campus ( Cardiff ) student and “Tequila Radio” in October 2008. MORE CHOICE LIMITED, a trading company with ‘Micro Entity Accounts’ where Kevin Daniel Moore’s partner, is Jonathan David Simon Warnes. Facts prove, a ‘relative’ relationship between 74-year old ‘Ian Moore’ and ‘Kevin Moore’ involved with yet ‘another’ earlier Trading company FIFTH DIMENSION TRADING UK LTD. The first directorship on file for Kevin Daniel Moore, was in 2000 with CORE DISTRIBUTION LIMITED. I’m not new to government intelligence semantical operations going on complex cross-border mission assignments, which I later discussed in many interviews. Where a criminal case of ‘murder’ is brought against ‘under-age sexually-abused teenage-defendants’, especially perpetrated by a ‘Chickenhawk homosexual predator’, facing State prison terms for murder plus more complex criminality factors, “hiding” in the ‘closet’ could be a highly sensible justification these teenage-defendants opted for never revealing to their family members, friends, their defense attornies, or prosecuting District Attorney because ‘such a case instance would be harder to make ‘justifications against a case of murder’. And, although unique, it would ‘not be the first court case where fear of reprisals ( outside prison and/or inside prison ) even-greater and ‘continued abuse against a clandestine victims’ situated as ‘criminal murder defendants’ would ‘most certainly be unjustly and instantly served insurmountable exacerbated psychological and physical torture’ were they to admit such embarrassing truths about what was actually occurring behind the scenes of these crimes. Furthermore, that were such to be presented in a ‘Motion’ ( brought before any court ) upon such ‘new evidence’ whereafter a more thorough review, an entirely different outcome would set all defendants free. But, what about Mark Richards? Was he not an ‘adult’ at the time of this ‘case in point’? Being a highly intelligent officer and gentleman of excellent character, Captain Mark Richards was investigated for 7-years whereupon conclusion was praised by a prominent man named Julian Salt ( United Kingdom ) when interviewed by the Project Camelot show host Kerry Cassidy in 2014. A career military officer should be asked, “What would you do if a ‘wealthy’ Chickenhawk extorted another career military officer who was ‘threatened to remain silent’ after a ‘construction job’ had its ‘teenage boy-helpers’ homosexually abused’ where if such ever became exposed it would mean the end of the career military officer’s ‘personal reputation’, ‘business reputation’, and ‘community reputation’? Now, where there is ‘military code’ and ‘honor” with strong sensibilities of one’s own ‘personal integrity’ being tossed-about like ‘just another plaything’ cleverly captured by a seething predator Chickenhawk manipulating adolescents by illegal narcotics, might – upon first becoming aware – ‘instant recognition of multiple lives at-risk’ whereas an adult, gentleman, and military officer could see a ‘unique Call Of Duty’ where an immediate ‘call to action’ be instinctively executed without any thought otherwise. Would a career military man take the law into his own hands and becoming Judge, Jury, and Executioner when such a threat is standing on the threshold? While some defense attornies may see a ‘court defense’ of ‘temporary insanity’ against a ‘criminal charge of murder’, who does one seek professional counsel to defend one’s reputation? Moreover, please, the name and number of the ‘government office of reputation lives protection’ is ‘seriously needed’ but unfortunately ‘does not exist for anyone on this world’. You want ‘truth’? But, can you ‘handle’ the ‘truth’? When the big bad boogey-man lands on one’s doorstep, they had better ‘be prepared’ – like an “Eagle Scout” to ‘guard against any threat, both foreign and domestic, or as any good ‘military soldier’ guard the world, or as any ‘mother’ would guard children. All of whom are ‘prepared to lay down their own life’, and that is ‘precisely’ what the world now sees U.S. Navy Captain Mark Richards having done for over 30-years. Say what you will, but always remember the ‘military code of honor’, and if you’re a “5 Star Civilian” hold-on tightly to your ‘integrity’ because ‘anyone or thing threatening to separate you from your own integrity’ is actually committing a ‘crime against humanity’. John McCain and many-many other soldiers who were ‘not captured’. 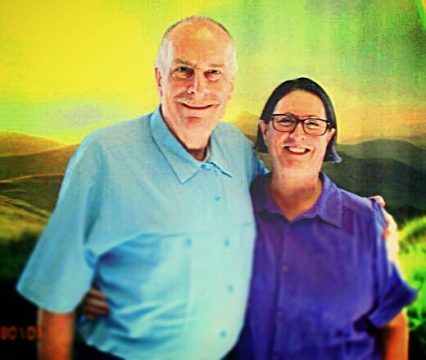 That woman, who was attacked by Kevin Daniel Moore, was none other than the current wife of U.S. Captain Mark Richards who as Project Camelot show host Kerry Cassidy broke the story of first when she publicly announced Mark Richards was still imprisoned after 30-years, and she was granted permission by State of California prison officials so, she could openly interview him about what he had to say about the Secret Space Program. Well, Kevin Daniel Moore and his debunking documentary partner Geoff Reed are out to sling mud more-so at Kerry Cassidy and her interview guests than Mark Richards who was ‘sent-up’ on charges of ‘masterminding a murder’, Captain Richards did not commit, but a teenage boy did. While the case is gruesome, here ( below ) is a little of what I discovered about Mark Richards case on appeal. Keep in mind that all prosecutors win their case based on the ‘theory’ they can present. Add-in, Police-turned ‘co-defendant testimony’, a body, ‘material evidence’ ( tools used in any killing ), and weeping relatives in a courtroom, and you instantly win a conviction. The more convictions one gains, the grander the benefits ( money, fame, and / or political power ) any prosecutor receives in-return. The question of whether Captain Mark Richards’ truthfulness, insofar as what he has conveyed to Project Camelot show host Kerry Cassidy about what he says has been well documented nine ( 9 ) times. The fact is, Kerry Cassidy is ‘not’ interviewing Captain Mark Richards about his ‘masterminding murder’ has gripped the soul of Kevin Daniel.Moore as well as Geoff Reid and their audience. One thing is for-sure, you won’t see Kerry Cassidy conducting any. clandestine stalking or attacking Kevin Daniel Moore in the middle of his addressing his audience. Furthermore, Kerry Cassidy exercises professionalism, high orders of discernment, courage, and with her integrity remaining intact, she is ever-vigilant and focused on her interviewing certain individual witnesses and others greater than seven hundred ( 700) for what has been personally attested-to and documented-by ‘without ever attacking anyone’; qualities respected by her audience of greater than 63,000,000 discernible people worldwide over the course of ( 13-years ). financiers, then those ‘without’ so much as one ( 1 ) paltry ounce of ‘integrity’ and ‘inability to correctly discern’ a ‘hatchet-job execution’ must be ashamed by-now after what this report reveals. So much for that type of ‘radicalized darker guerrilla journalism’, which Kerry will not waste people’s time and attention on because everyone knows that more positive accomplishments come when turning one’s back away from ‘dark side’ powers that hide in everyone’s midst. -Andrew Campbell;[ assisted in, ‘corpse disposal’ ]. According to the Appellate Court ruling, about 2-hours after Richards and Hoover left with Baldwin who was murdered, upon Hoover and Richards return to Baldwin’s house, Richards told Campbell ( who waited at Baldwin’s house after gathering-up any valuables ) that, he ( Richards ) did not want to discuss what happened ( Baldwin’s murder ), adding that it ( the scene of the crime ) had been “bloody,,” plus Richards wanted to quickly complete burglarizing Baldwin’s house by having such items removed. Further, the Appellate Court ruling depicted the defendants purchasing a boat, and the evening of the murder ( earlier that same day ) having towed the boat to Loch Lomond Marina, and returning to the Baldwin shop where Baldwin’s body lay ( in a pool of blood ) under Baldwin’s Rolls Royce automobile. resting atop the four ( 4 ) wheeled creeper. The three ( 3 ) defendants then used a mechanic’s “creeper” to move Baldwin’s body ( wrapped in plastic ) to Richard’s truck, drove to their boat, and dumped the Baldwin corpse in San Francisco Bay. Taken from the Baldwin’s shop were, “weights” – to sink Baldwin’s corpse – that snapped, forcing defendants to use an extra motor from the boat to sink Baldwin’s body was subsequently found floating in the San Francisco Bay of California. Further from the Appellate Court ruling statement was that, later examination showed Baldwin’s body had sustained two ( 2 ) frontal stab wounds to his heart, a skull fracture, and brain damage attributable to a blow to the left occipital portion of the skull, and a bloodied screwdriver and bloodied wrench were apparently depicted as murder weapons found ( by authorities ) inside Baldwin’s shop. Number 8363 of the People v. Mark Richards found him guilty of a 1982 murder enhanced by legal intrinsic weight of ‘special circumstances’ even-further by additional factors amidst just this one ( 1 ) murder so, instead of Captain Mark Richards being charged with a crime of ‘Conspiracy To Commit Murder’ he was ‘definitively framed-up to even-more crimes that served to exacerbate his prison sentence into incarceration “without possibility of parole;” therein, ‘until death behind bars’. In the midst of the defendant’s Trial, in 1983 defense counsel appealed several counts where only ‘one ( 1 ) criminal count of the special circumstance allegations’ against the defendant ( Mark Richards ) was later ‘dismissed’ by the higher-level Appellate Court upon reviewing his criminal charges on trial at the lower-level Superior Court hearing, he was Ordered to continue facing the consequences of those other remaining charges he was later convicted of and sentenced to serve ‘life in prison without the possibility of parole’. The aforementioned ‘dark side’ as painted by the court case based on the “theories’ of the prosecutor’s pressuring a ‘teenage boy murderer’ to testify against a former career military officer ( Captain Mark Richards ) boils down to whose testimony is one going to believe. Underage teenagers whose adolescent world is ‘all about them’, attracted to things like cool cars, then-illegal drugs, and all the fast times at Ridgemont High popularity they can grab (one way or another ), or are you willing to sit down with an officer and a gentleman who’s only ‘talking in an interview about COSMIC level secret issues’ while he remained moot, by, ‘not’ saying anything about his ( Richards ) court case. A blindfolded summary, of which, from the standpoint of the defendant’s judge, jury, and executioner is reviewable, but without so much as even one ( 1 ) smidgen of unbiased behind the scenes evidence, which now rests in the eye of public opinion including, but not limited to, ‘you’, behavioral psychologists and other advisory professionals – those whom are well-seasoned and quite adept as-to ‘how-to read between the lines’ in case reporting reviews. Discernment is in the eye of the beholder and humanity’s decisionmaking process is never easy, however for sensible adults it becomes more-times correct than when we were young going through learning curves. We all grow up, one way or another, and life depends on all of us doing the right thing. LOS ANGELES – October 31, 2018 – What really drives people be so uncharacteristically away-from normalcy? Albeit, incorrect or not, troubling is the question as to why research and write non-stop for 14-hours + without so much as one ( single ) restroom, food or beverage break? With no apparent motive, what then possesses a person to go one step beyond? Whether it’s the Boogey Man, Angels of Light, or a far-more benevolent soul ( here or off-World ) influenced a recent ( October 30, 2018 ) report comment theorizations’ having only read-of a seemingly ‘off-handed’ and ‘biased’ comment within official Court ruling statements indicating a Co-Defendant claimed Captain Mark Richards said to him. In an a much later and different type-of Court case, a legal filing was eventually presented by defense counsel representations of Co-Defendant Crossan Hoover Jr.
Hoover, one ( 1 ) of three ( 3 ) defendants ( Hoover, Campbell and Captain Mark Richards ) who were all earlier found ‘guilty of murder’ – even though ‘Hoover officially admitted to the killing. Murdered, was a restorer of vintage automobiles who was also the classic car dealer Richard Alexander Baldwin. The original ( earlier ) County Of Marin Superior Court murder case first evidenced the 90-minute taped confession of Crossan Hoover Jr.
Captain Mark Richards, who still remains in prison after 30-years for committing a crime of “murder” on Baldwin, a case that eventually saw the ‘officially documented killer’ ( Hoover ) Ordered by a latter Court ruling to be set free. Hoover’s freedom, however, was short-lived because the District Attorney filed an Appeal whereafter Defendant Hoover was re-imprisoned on his original 25-year sentence for Killing Baldwin. It appears Hoover was ‘ajudged eligible for parole’ even though he was the only defendant who actually ‘killed’ Baldwin, but was only ‘actually serving 1/3rd of a 25-year sentence’ but ‘actually less’ if deducting his ‘time spent incarcerated while awaiting Trial and Sentence pronouncement’ by the Superior Court Judge. The State of California Department of Corrections prison system has Hoover listed for “Parole Eligibility” back during “January 1999” as well as ‘still currently imprisoned near Soledad, California. Technically and legally speaking to the sentence of Hoover, he should have already been released from prison no later than 1990, and although Hoover was Ordered “released” – prior to the Prosecutor pleading on Appeal to overturn that post-sentencing decision, Hoover should have already been released long ago. Upon further research, the now-deceased Baldwin was exposed in another official Court record as being a wealthy, gay ( homosexual ), ‘child sexual predator’. Evidence, during the murder case of all three ( 3 ) Defendant’s, their ‘Defense attornies’ and ‘Prosecutor’ ( Deputy D.A. Edward Berberian for County of Marin ) were well aware of what they all ‘purposely kept out of the official Court record’, in addition to their ‘hiding facts of sexual abuse’ from ‘professional’ “Expert Witnesses” ( 3 ); namely Medical Doctors ( Psychiatry ) whom were manipulated by the Prosecutor ( Deputy District Attorney Ed Berberian ) who skewed the entire Trial resulting in its Court outcome ruling of ‘Guilty’. In January 2009, a U.S. federal Magistrate’s Court overturned the September 2007 Crossan Hoover’s murder conviction and sentence of ’26-years up-to Life in Prison’ whereupon that new ruling said that ‘the original Jury might have found Hoover insane’ if the original Superior Court Trial Judge had given a proper definition of insanity, and ‘if the Prosecutor had not withheld information from an [ Expert ] Witness [ Medical Doctor of Psychiatry ]. In a bizarre twist of bizarre latter events, the Prosecutor appealed the aforementioned federal Magistrate decision Ordering the release of Crossan Hoover Jr. from prison, whereupon the federal Ninth U.S. Circuit Court of Appeals ( San Francisco, California ) later ruled that ‘the original State of California Superior Court had concluded reasonably’ that any errors at Hoover’s trial did not affect the verdict and that federal Judges were legally required to accept that Court’s finding’, which remanded Hoover back into state custody to finish his prison sentence. Law enforcement, based on ‘paper materials’ seized from within the home of Captain Mark Richards, suspected that Richards was plotting to take over the County Of Marin’ after finding ‘paper references’ to a ‘fictitious’ group named “Pendragon” ( not, ‘Pentagon’ ). What ‘amorously over-suspicious’ authorities later discovered was, that the ‘paper materials’ of Richards’ they had seized had only been ‘purposely used’ to ‘write a science-fiction book’ entitled, “Imperial Marin,” which his wife Caryn Richards verified as having already gone out to Los Angeles, California for ‘publishing’. Unfortunately, law enforcement didn’t know where to look because they never bothered to ask for any details about ‘who’ the book was being ‘published by or for’ and under ‘what name’ ( i.e. a pen name, someone else’s name, etc. ). Poor investigations helped fan the ‘fake flamed Theort’ of the Deputy District Attorney assigned to prosecute this murder case. The fake yarn, about ‘Pendragon’ woven falsely by poor law enforcement comprehensions, was next carried even further forward by the Prosecutor’s tale presented to the Court. Of course, the mainstream media news carried the ‘official storadjudgedkery’ to millions of people too. Corrupt dogs, upon other dogs, all sniffing each other’s waste remnants eaten by the Press dogs who fed hearty loads of it to people who gobbled it up too. In an odd display of events, the dogs of the District Attorney prosecution team re-joined mainstream news media dogs whom mysteriously had individuals come to them testifying that they had somehow been ‘members’ of the “Pendragon” ‘cult’. Then again, were not dealing with Rhodes scholars whom majored in the English language so maybe those that came forward actually belonged to an ‘occult’ group named ‘Pentagram’ and so perhaps, put-forward was just yet another confusing example of rocket scientists who are not phonetic geniuses at sounding-out or spelling words either. Evidence ( multiple types ) were ‘kept hidden away-from 3 government doctors’ all whom were ‘purposely kept unaware’ of many ‘pertinent’ “emotionally disturbing facts” having occurred “outside the four walls of the Court” that were ‘kept concealed’ by “agents of that Court,” i.e. District Attorney Prosecutor plus all the Defense attornies, all three ( 3 ) of the Defendants ), and, consequently, kept out-of the eyes of the public, mainstream news media, and a certain recent alternative media broadcaster too. Defendants Hoover, Campbell and Captain Mark Richards were all found guilty, even though 2 defendants ( Mark Richards and Campbell ) did ‘not kill Baldwin. 3. Sentenced to imprisonment for ‘murder’. In the murder case of Hoover, Campbell, and Captain Mark Richards ‘special circumstance’ enhancement charges levied by the Prosecutor ( District Attorney ) for the ‘additional purpose’ of ‘lengthening all 3 of the Defendant’s prison sentence terms. One ( 1 ) person, actually killed by one ( 1 ) person – within America’s State of ‘California – ‘actually netted 3 Defendants with 3 sentences of “Life In Prison’ PLUS ‘Without any possibility of being granted Parole’. Three ( 3 ) Defendants – ‘2 of whom did not kill the victim ( Baldwin )’ – are sentenced to ‘Life In Prison’, but also for their ‘Entire Natural Life Until Dead’. ‘Life’ is ‘not really’ “Life” if it’s ‘Unlimited Life’. Sound strange and confusing? Once you learn what “Life In Prison” ‘precisely means’, within the State Of California ‘penal system’, it comes as a shock to a great number of people. What most people ‘hear’, ‘read’, and then actually ‘see’ what occurs contravenes all logic like secret rules within the Illuminati. People ( criminal case defendants ) whom are ‘incarcerated in prison’ have been ‘Officially determined’ to have a ‘different’ “Lifespan” of only “45-Years” because Actuaries for life insurance companies use ‘comprehensive prison statistics’, which equate approximately one ( 1 ) ‘Life-Year’ in ‘freedom’ to two ( 2 ) ‘Life-Years’ in ‘incarceration’. Sentencing, on a ‘Murder’ conviction ( alone ) with ‘no’ “Special Circumstance” ( ‘sentence enhancement’ charges ), in a California prison for “Life In Prison” is ‘initially’ “45-years,” however after calculating a “Good Time” ( ‘good behavior’ ) ‘subtraction’, only 2/3rds ( of 45-years ) is what ‘technically’ remains left to serve in Prison. But, wait, there’s ‘more’ “subtraction” off a Defendant’s sentence. It’s called, “Work Time” ( where a prisoner routinely works a ‘shift’ of time within a 24-hour period ) and THEN a Defendant’s ‘sentence is reduced’ an additional 1/3rd off his 45-year ( Life In Prison ) sentence. So, with ‘Good Time’ ( behavior ) plus ‘Work Time’ ( labor ), a “Life In Prison” ( 45-years ) sentence is reduced to only ‘1/3rd’ of 45-years. But, wait ! There’s even another deduction of that ‘Life In Prison’ ( 45-yr. sentence ) that only equates actually to ’12-years’. Defendants automatically get what’s called, “Credit For Time Served” coming from their ‘awaiting trial until final sentencing’. Doing the ‘math’, the longer a Trial on a Defendant takes, the ‘greater the sentence reduction; nevertheless, it is an ‘incarceration time period’ credited back to Defendants. 4. NO ‘Credit For Time Served’ ( prison-time reduction because one can’t slice-off 1/3rd ) of ‘Unlimited Imprisonment’. So, the Court’s Judge sentence additional clause of “Without Parole” translates into a ‘Death Behind Bars’ term of imprisonment. Just so people can now ‘see’ ( easily with their own two eyes ), this report provides ‘easy comprehension’ and ‘with precision’, the raising of mass general audience’s public awareness of ‘several’ ( but, ‘not all’ ) ‘multiple ‘lies secretly buried’ beneath all the Courtroom, Prosecutor, Mainstream News Media, and a certain Alternative Media ( The Kevin Moore Show, et. al. ). And whom, alongside others, ‘unjustifiably’ drove and steered ‘drummed-up drama’ through ‘negative publicity’ for purposes of ‘self enrichments’ toward ‘certain government-led media goals’ against Captain Mark Richards. While multiple-more secrets, yet to-be revealed, what additionally exists is they were indeed ‘buried’; until, this report. My research discovered that within a ‘subsequent’ and ‘entirely separate Court record’ – shortly after all 3 Defendant’s murder conviction – ‘legal excerpts’ to enlighten more people as to what ‘my earlier ( October 30, 2018 ) report ( Pointing To Higher Ground ) (see above for Part One) ‘theory’ projected. Military soldier mindsets are ‘not passive attitudes’. Militarized ‘code” mindsets border on quasi-psychotic, and when soldiers and prisoners SNAP. I believe Mark, from his military bearing and observational trainings was able to quickly assess Baldwin’s behavioral ( e.g. body expressions, sordid colloquies, etc. ) and / or ‘other escapades’, forcing Mark to bite his own lip for perhaps, a long time while the welling-up of such emotionally mind-wrenching seethings over Baldwin’s disgusting behavior would cause him to snap-out horrid comments. But, to carry such through to the point of really mapping-out a murder like a schematic? Co-Defendants and at-least one ( 1 ) Witness were all in their ‘teenage’ years when ‘all children’ are ‘extremely impressionable’. I discovered even more secret facts behind Courtroom psychiatrists and the psychotropic medications and other drugs Co-Defendant Hoover was on, plus just how ‘psychiatric evaluations’ were conducted only upon first medicating Hoover and his calm behavior influencing psychiatric doctors to testify that Hoover was ‘sane’. Were it not for my discovering these and further ‘official informations’, that had been hidden away-from public Court records that did not show these evidences, none would ever be known. Fortunately, my discoveries see my report exposing it now. Both, ‘Prosecutor’ AND ‘Defense attornies witheld what was occurring in the background so, all 3 of the government taxpayer paid Psychiatrists ( 3 ) whom testified were prevented from asking proper psychiatric evaluation questions. It is now quite obvious that the government Prosecution Team, Judicial Team, and even the Defense Team were all unjustifiably skewing the entire Trial process on three ( 3 ) Defendants; human beings whom never stood a snowball’s chance in hell of ever having a ‘Fair Trial’ because of this type of ‘strategically layered corruption’. There’s more, but here’s what’s happened. I found ‘that’ after I e-mailed my report perhaps, yesterday’s so-called “download” was more on-target as-to what may have actually been going-on “outside the four walls of the Court,” which lawyers ‘use’ as a ‘legitimate means by-which murder convictions are overturned’. And while it is an highly embarrassing topic, in and of itself, ‘the Truth may set them free’. Just a thouģht. If you cannot see the little but beautifully natural trees hidden behind the towering overgrowths of a corrupted and deceitful a forest, a buzz-saw of enlightenment works pretty well to tear-away all the subterfuge. If you enjoyed reviewing reports from the UPI Guy, please support these research efforts and work-products for the Project Camelot audience and its visitors. Thank you for reviewing this report. If you did not enjoy any of my research reports, please drop me your e-mail letting me know why and what parts you didn’t. I welcome positive and negative feedback because what ‘you’ have to ‘say’ is very important to improvements. Paul Collin has greater than 40-years experience within the Intelligence Community involving several clandestine case situations worldwide. Only two ( 2 ) of which cases became domestic U.S. federal cases in America. In 1983, one ( 1 ) case involved the U.S. Central Intelligence Agency ( CIA ), United Nations ( UN ) North Atlantic Treaty Organization ( NATO ) Intelligence, U.S. Secret Service Foreign Branch ( SSFB ), U.S. Department of the U.S. Treasury, and U.S. Department of Justice ( DOJ ) Federal Bureau of Investigations ( FBI ). From 2002 – 2006, the second ( 2nd ) case involved the CIA, Treasury, FBI, and U.S. Comptroller of the U.S. Currency. This latter case wherein simultaneously to his other foreign missions conducted from within Eastern Europe to mutiple other areas around the world, Paul was in addition to his other foreign missionings, a “global information asset” working with two ( 2 ) “CIA-DOJ Squad Six” Special Agents on specific foreign missions with domestic objectives. From September 2006 – October 2007, Paul worked in the background, performing intensive and extensive case law research that successfully defeated a supposed slam-dunk federal criminal case against five ( 5 ) federally incarcerated ( imprisoned ) defendants facing up-to 1,500 years ‘each’. It was because of ‘dedicated ethics of discernment’ coupled with ‘personal integrity’, Paul provided a group of ten ( 10 ) federal defense attornies with key critical ‘tactical legal defense information’ forcing testimony of a foreign national working secretly as a U.S. government intelligence Non-Official Cover ( NOC ) who had ‘gone rogue’ after fraudulently enriching himself, which the lead defense lawyer presented thereby forcing the federal Office of the U.S. Attorney to file a federal court legal “Motion” that in-essence led to reducing all defendants potential federal prison sentences ( up-to 1,500 ears ) down-to a “plea deal” guaranteeing a prison sentence of ‘no longer than 18-months’ plus ‘credit for their time served awaiting trial’ upon their entering guilty please before one ( 1 ) federal court. That case work was ‘personally conducted from behind the scenes before their trial’ and ‘during their trial’ while simultaneously working clandestinely with the CIA Deputy Chief led “Squad Six” DOJ agents until 1-year ‘after their trial’. Those aforementioned facts can be attested-to by both ‘witnesses’, ‘documents’, ‘written communiques with corresponding replies’, of which partial reports were written and self-published online ( internet ) from 2002 through 2007. In 2012, Paul Collin began as a voluntary Whistleblower for Project Camelot Productions. In 2013, Project Camelot producer Kerry Cassidy asked Paul Collin to be one of her selected Guests whom has since voluntarily agreed by providing exclusive research and reports over the past 7-years as freely available to people worldwide.